A Prunus domestica L. cultivar. ‘Fruit below medium size, round, and marked with a shallow suture. Skin greenish-yellow, thickly covered with white bloom. Stalk half an inch long, inserted in a pretty deep cavity. Flesh yellowish-white, firm, rather coarse-grained, but sweet and pleasantly flavoured, separating from the stone. Shoots smooth. A dessert plum of second-rate quality. Ripe in the beginning and middle of September.’ [Hogg – Fruit Manual p.259/1860]. ‘Small Reine Claude, an old variety of unknown origin, is now probably obsolete. Thomas and Downing described it as an English Yellow Gage but it cannot be found that it is ever so called in Europe. Since the variety was known in France and Austria in the latter part of the Eighteenth Century it is quite certain that it originated on the continent. From its name and close resemblance to the Reine Claude it is safe to state that it is a seedling of that sort.’ [Plums of New York p.347]. ‘Yellow Gage’ may be the variety figured as ‘Petite Reine Claude’ by Saint-Hilaire’ [pl.224/1830]. (See ‘Reine Claude’). 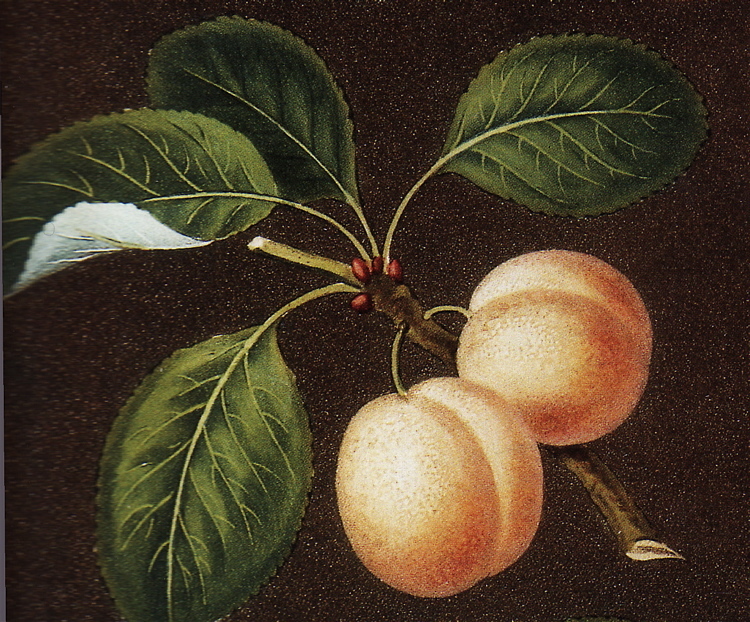 Pomona Britannica figures a plum called ‘White Gage’, which is also given as a synonym of ‘Yellow Gage’. This is the illustration used here, but these plums appear quite different and I cannot accurately determine which was grown by Macarthur. Listed in all published catalogues as ‘Yellow gage’ [Plum no.8/1843].